Before we dig into features, if you need to create a LinkedIn company profile, go do that. It’s a simple process to get started. And to access the editing function of the Overview page, select the Admin button > Edit while in the overview tab. Just like Facebook, status updates are a way to keep your community engaged, expand your network and provide valuable information to your followers. LinkedIn states the best practices for updates are to make them “authentic, relevant and short,” and that posts that feel spammy will not be shared (wish they could say the same for company profiles in their search results, but we’ll get to that later). You can see impressions and engagement information on visible updates, but we don’t have the functionality for you to view old posts or the metrics related to those posts. Up to 20 updates will appear on the Overview tab and the most recent one will be at the top. Posts can be up to 500 characters (including spaces). Shared link titles and descriptions can be up to 250 characters each. If you already have a LinkedIn share button enabled on your site, when your content is shared through that button, it’s entered into the LinkedIn ecosystem and shown to targeted users. But you can give that content an added boost by showing it to your followers through a status update. Remember, people who follow your company are likely subscribing to your status updates and may even have a digest that is delivered to them into their email boxes. But don’t stop with content from your site or blog. Experiment with different types of status updates — text only, images and videos — just like you might in your Facebook community. 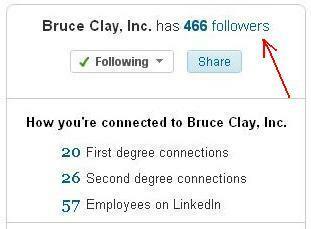 The cool thing about LinkedIn is, you can see detailed information about who your followers are. Select the follower count button and dig into the types of people who are following you. Take this data and compare it with other metrics, like the metrics you’re tracking in your Google Social Analytics reports for LinkedIn. This can give a bigger picture of how content that’s shared on LinkedIn is contributing to your goals. Also keep in mind that users can control what types of notifications they receive about the companies they follow, including things like employees leaving or joining the company, new job opps and profile updates. So you want to make the posts meaningful and you’ll also want to experiment with the frequency of the posts, too. People likely don’t want to be inundated with too much information in their updates about your company. You have about 1,487 characters with spaces to create your company description. You can use this opportunity to provide important information about your company and optimize it with keywords. As far as rankings go for results within LinkedIn, the company has made it clear that there is no single rank for LinkedIn search and that relevance is based on a variety of factors that changes from search to search, user to user. LinkedIn gives little detail as to how it ranks company profile pages, but in a short video, it does allude to the fact that keywords and strength of network connections of the searcher to the company is a factor. LinkedIn has also recommended you order the keywords that describe your company starting with the most important in the “specialties” list. The specialties list is offers 2at the bottom of the company description and gives 20 fields and up to 256 characters to input the keywords related to what your company does. Use the keywords here that you want to be found for in LinkedIn. I did a quick analysis myself of the results returned to me in a company search using the keywords “SEO” and “search engine optimization”, and found that keyword usage and placement does seem to matter. I should note the results I examined were the default — all industries, all locations. Anyone can drill down to refine the results based on that criteria and more. Of the top-ranked results for those key terms, the company size, location and followers varied, but they all had something in common: they had the keyword phrase in both the company description and down in the “specialties” area. 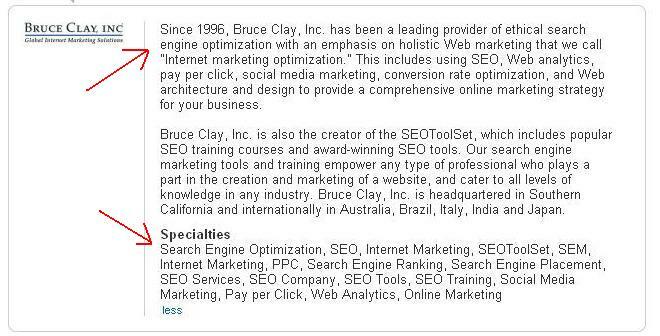 Here’s a snapshot of the term “search engine optimization” showing in both the company description and specialties area. In every case, the keyword showed up before the cutoff “more” link that expands to give the full description about the company (about 300 characters in). Whether or not that has anything to do with the ranking algorithm, I don’t know. But it is a good practice to have all your important terms up front so when users scan the content, they can make quick assessments of your company and its services. Also, in every case except one, the keyword was placed first among the list of specialties – just as LinkedIn had advised to do. Back to LinkedIn’s statement about strength of network affecting the results. It’s notable that for the top 10 results for the keywords “SEO” and “search engine optimization”, three out of 20 of the company profiles returned were in my network, the rest were not. And the company profiles in my network had more natural company descriptions than the rest of the results. Crazy, right? Obviously, these profiles provide no value to the LinkedIn community, so it’s not as if they’re snatching up business from top-rated brands, but it’s still pretty lame they’re ranking. You can add up to five locations for a business. If you have more than five, choose the locations wisely. LinkedIn users can search for companies by location, and LinkedIn has stated its company directory is automatically generated by company pages that have the most activity per industry and location. So choose those locations that are the most crucial to your products or services if you have more than five to list. When choosing your industry, if it’s a toss up between two or more, you might find you’ll need to do some research on what people search for when looking for your products or services. See what your competitors have listed as their industry as well. Use this data backed by your own wisdom on how your clients would categorize your company to make the appropriate choice. If you’re not sure, try testing. See if it affects your search results in LinkedIn or try to track if one drives more users to your profile than the other using the page statistics. A guest post late last year on Search Engine Land talked about the potential power of inbound links from LinkedIn, and how certain factors could affect the power of those links. In his post, author George Aspland gives tips on how to boost the authority of a LinkedIn company profile; this includes the number of employees associated with the company page, the activity of those employees on LinkedIn, the optimization of their profiles and more. So, it’s not a bad idea to make sure all your company employees on LinkedIn are affiliated with your company profile, are active and are building strong profiles and networks of their own. In the edit function, scroll down to the “company blog RSS feed” field and simply copy and paste the URL for your feed. We use Feedburner but recently noticed it doesn’t keep our feed current. So make sure you’re monitoring your feed to ensure your content isn’t stale on your LinkedIn page. Having this stream of posts doesn’t mean you should completely ignore sharing the most important content you have in your status updates; it’s not guaranteed people will be following the feed list just because it’s there. And as an FYI, the company activity shown towards the bottom of the overview tab is automatically generated, and is a combination of activity surrounding company employees, status updates from the company page and more. In the next post in this series of optimizing your LinkedIn company profile, we’ll take a look at the Product and Services tab. Thanks for the comment. Maybe you can share a couple of your favorite tips for optimizing personal profiles? Thanks for sharing Jessica, I’ve only ever updated my personal profile instead of the company profile. A great wake up call! For reals, Nick — LinkedIn has some improvements to do in that arena. 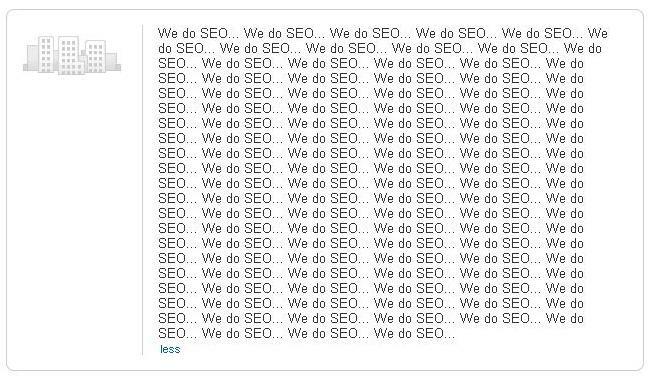 Is that “we do SEO” profile for real? It’s crazy that something like that would show up in a result. Like you said, obviously nobody would take it seriously, but clearly there’s an issue with the spam filters. Great post about LinkedIn for B2B companies. Have you seen anything about whether or not LinkedIn can be valuable for B2C companies? And for LinkedIn help, just access LinkedIn’s help center when you are logged in, type in a question and voila. Also Check YouTube for more videos; you can click through that video in this post to see related videos from LinkedIn’s channel or go directly to its channel. This is the best post I have ever read about optimizing LinkedIn, very informative. I’m going to implement these techniques this week and can’t wait for the other parts. Does LinkedIn have anymore tips videos that you know of? Also would love to get your input on advertising on LinkedIn and if you think it’s effective or not?